In the process of SMT, the suction nozzle is quite easily adhered with solder paste or dirt etc. If maintenance has not been done for a long time or the cleaning is not thorough enough while maintaining it, the paste and dirt will be hardened so as to increase the difficulty of cleaning, even it will result in blockage and scraps after long-time accumulation. 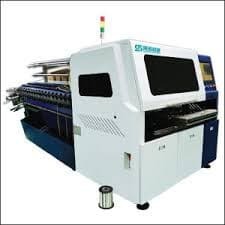 It practically proves that the S-U24cleaning machine can effectively deal with inflexible solder paste and thoroughly clean the suction nozzle with complex structure. Carrier Clip is the very common wearing parts in Radial insertion machine. We manufacture the high copy spare parts , promise the quality and keep low cost . Very welcome to inquiry . How does SMT electronics assembly work? Electronics manufacturing using surface-mount technology (SMT) simply means that electronic components are assembled with automated machines that place components on the surface of a board (printed circuit board, PCB). Electronics manufacturing using surface-mount technology (SMT) simply means that electronic components are assembled with automated machines that place components on the surface of a board (printed circuit board, PCB). 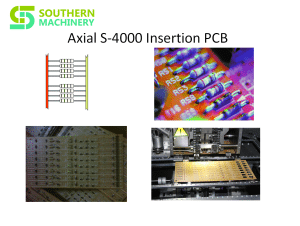 In contrast to conventional through-hole technology (THT) processes, SMT components are placed directly on the surface of a PCB instead of being soldered to a wire lead. 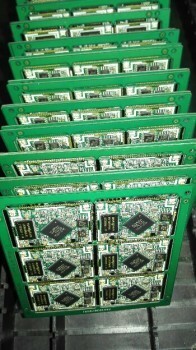 When it comes to electronic assembly, SMT is the most frequently used process in the industry. Soldering the boards with a reflow process. Applying soldering paste is one of the first steps in the SMT assembly process. Soldering paste is “printed” on the boards using the silk-screen method. Depending on the design of the board, different stainless-steel stencils for “printing” the paste onto the board and various product-specific pastes are used. Using a laser cut stainless-steel stencil custom made for the project, the soldering paste to be applied only to the areas where components will be soldered. After the soldering paste is on the boards, a 2D-soldering paste inspection is performed to ensure that the paste is evenly and correctly applied. 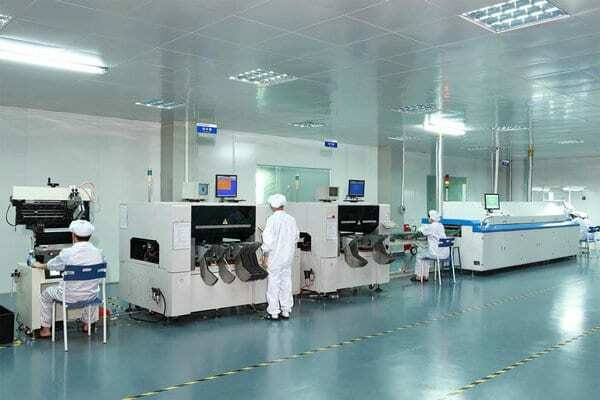 Once the accuracy of the soldering paste application has been confirmed, the boards are transferred to the SMT assembly line, where the components will be soldered. 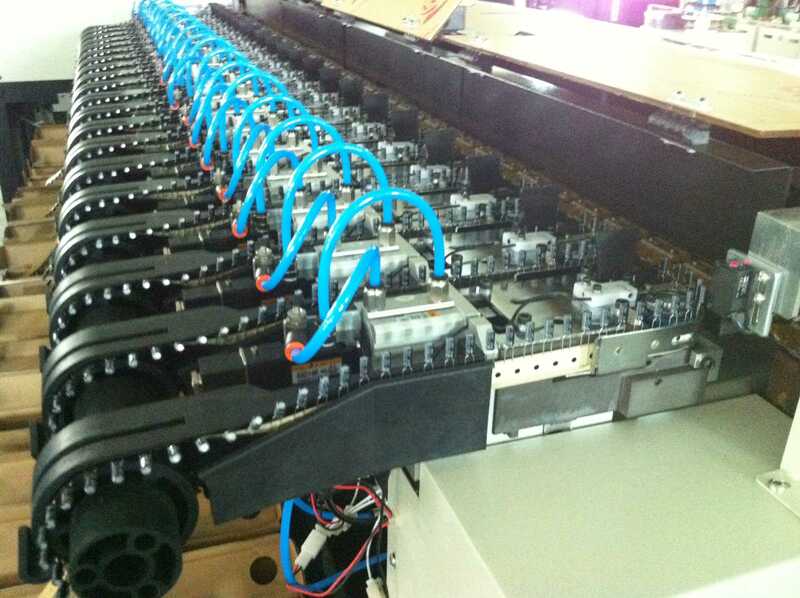 The electronic components to be assembled come in trays or reels, which are then loaded into the SMT machine. During the loading process, intelligent software systems ensure that components are not inadvertently switched or misloaded. The SMT assembly machine then automatically removes each component with a vacuum pipette from its tray or reel and places it on its correct position on the board using precise pre-programmed X-Y coordinates. Our machines are capable of assembling up to 25,000 components per hour. After the SMT assembly is completed, the boards are moved on to the Reflow ovens for soldering, which affixes the components to the board. To solder electronic components, we use two different methods, each of which has distinct advantages depending on the order quantity. 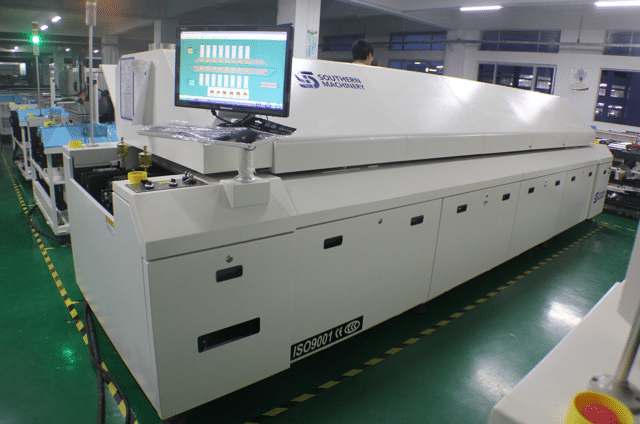 For series production orders, the Reflow-soldering process is used. During this process, boards are put in a nitrogen atmosphere and are gradually warmed up with heated air until the soldering paste melts and the flux vaporizes, which fuses the components to the PCB. After this stage, the boards are cooled off. As the tin in the soldering paste hardens, the components become permanently affixed to the board and the SMT assembly process is completed. For prototypes or highly sensitive components, we have a specialized vapor-phase soldering process. In this process, boards are heated until the specific melting point (Galden) of the soldering paste is reached. This allows us to solder at lower temperatures or solder different SMT components at different temperatures depending on their individual soldering temperature profiles. Soldering is the second-to-last step of the SMT assembly process. In order to ensure the quality of the assembled boards, or to catch and correct a mistake, AOI visual inspections are performed for almost all series production orders. Using several cameras, the AOI system automatically checks each board and compares the appearance of each board with the correct, pre-defined reference image. If there are any deviations, the operator of the machine is informed of the potential problem, who then corrects the mistake or pulls the board from the machine for further inspection. The AOI visual check ensures consistency and accuracy in the SMT assembly production process. Do you really know how to build a SMT dust-free workshop in LED solution? Before manufacturing led lights, it’s very important to conduct SMT factory planning, especially for any newly-built SMT factory. 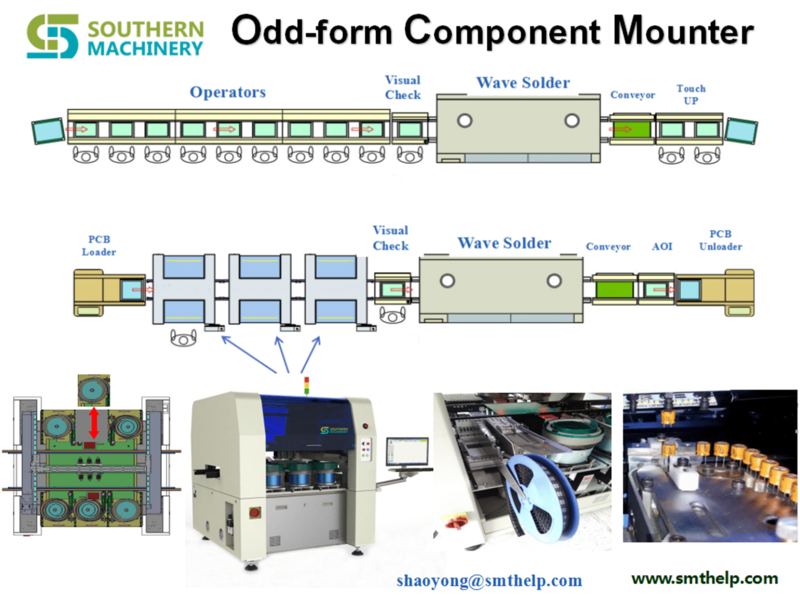 New factories have little experience in SMT factory design layout and SMT workshop design so there may be some details lost during the set-up phase. After production begins, discovering problems after the fact can cause unnecessary losses. 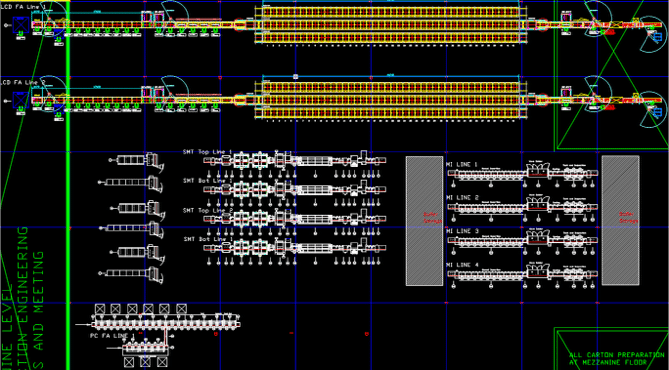 So why not design your SMT factory layout and plan with these potential issues in mind and prepare in advance? Learn SMT clean mounting workshop production requirements in this article. Factory ground bearing capacity should be greater than 8 kn/m2. Vibration should be controlled in less than 70 db, the maximum value of no more than 80db. The noise should be controlled within 70 dba. 380 (380 + / – 10%, 50/60 hz), more than double the power consumption of power supply of power than. According to the requirement of the equipment configuration of air pressure, can use plant air, and also be configured individually oil-free compressed air machine, general pressure is greater than 7 kg/cm2. 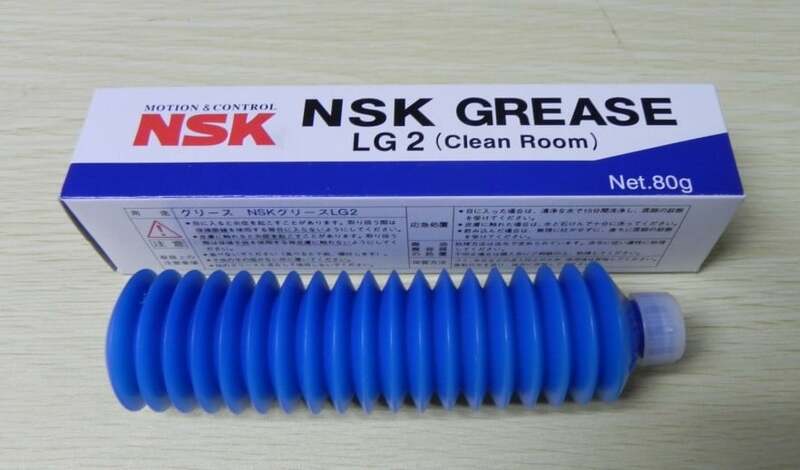 For clean, dry cleaning the air, so the need for compressed air to oil, dust and water treatment.Made from stainless steel or pressure plastic air duct. Reflow soldering and wave soldering equipment need exhaust fan.For hot blast stove, exhaust pipe of the minimum flow rate value is 500 cubic feet per minute (14.15 m3 / min). In the ideal of the plant Illumination is 800 ~ 1200 lux, at least not less than 300 lux, when low intensity of illumination, in the inspection, repair, measurement work areas should install local lighting. Factory to keep clean, no dust, no corrosivegas.Production workshop should have cleanliness control, control the cleanliness: the class of 500000. Production workshop environment temperature to 23 + / – 3 ℃ is the best, average of 17 ~ 28℃,relative humidity is 45% ~ 45% RH. 1.2 Are Work Instructions readily available to the operator and are they followed at Component Placement? 1.3 Are component part numbers and descriptions included on the Work Instructions? 1.4 Are component descriptions sufficiently detailed to check at first-article that the correct components are being used? 1.5 Is the machine head/slot number for component loading specified for each part number on Work Instructions? 1.6 Are the reference designators and the quantity per part number specified on Work Instructions? 1.7 Is the component feeder type/size specified on Work Instructions or otherwise for each component package type? 1.8 Is the machine Program Name specified on the Work Instruction or line set-up instructions? 2.2 Are the component loading verification aids hard linked to the placement program so that loading is verified against program data? 2.3 Can traceability of component lot codes be demonstrated for critical devices? 2.6 Is the correct feeder loading base used to facilitate real to feeder loading? 2.7 Are first-built boards verified against documentation for missing/misplaced components and for correct component polarity? 2.8 Are first-articles conducted using AOI methods and complemented with description verification and value metering? 2.9 Are all Resistors & Capacitors measured for a value within the tolerance (one per part number) at first-article & at reel change? 2.10 Is a first-article log signed to verify acceptance before start up? 2.11 Is the orientation of Tantalum SMT capacitors, Diodes, etc in tape format, standardized and documented for polarity orientation? 2.12 Is the IC tray loading polarity standardized for each type of polarity indicator that can be used for each component? 2.13 Is loading polarity referenced both from the tray and the component so as to ensure retrayed components are correctly loaded? 3.1 Is there a document which details the standardized nozzle diameter set-up selected for each type of placement equipment? 3.2 Are these standardized nozzle diameter set-up documents readily available for when nozzles need to be replaced or changed? 3.3 Is there a document which details the range of component XYZ body sizes that each selected nozzle type can successfully place? 3.4 Is there a documented requirement to conduct daily nozzle centering and is there evidence that this is done? 3.5 Is each feeder identified with its own unique serial number? 3.6 Is there a documented and effective Feeder Maintenance Program? Records (s/w or otherwise) must be by Feeder Serial Number. 3.7 Are database records maintained for each feeder serial number for the purpose of tracking its maintenance history and performance? 3.8 Is feeder maintenance history used to monitor feeder life so that problematic feeders can be removed from the process? 3.9 Can it be demonstrated that the number of feeder indexes is counted & monitored for each unique feeder using software or otherwise? 3.10 Is this information used to flag that feeder preventative maintenance is required after x number of indexes? 3.11 Is there a documented requirement to indicate that Blocks or Support Pins are needed for specific products? 3.12 Is the No, location, type and height of Support Blocks/Pins identified on a product by product basis? Score NA if in 3.11 there are not needed. 3.13 Are the Support Pin locations identified for each product using templates/tooling or some other effective solution? Comment as above. 4.1 Are components stored before loading and after unloading in a manner which prevents damage? 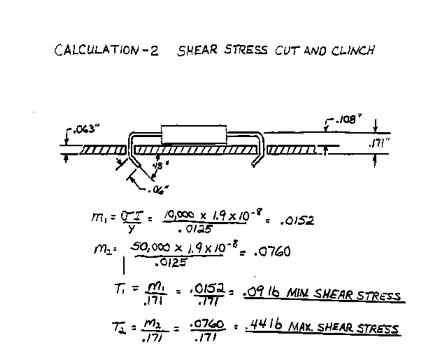 4.2 Are the Moisture Sensitive Devices (MSDs) and their sensitivity level readily known to the operator? 4.3 Are MSDs time stamped at opening and their exposure time monitored against pre determined limits? 4.4 Is there a flag to indicate that the exposure time has been exceed for any given device in a dry box? 4.5 Is there a flag to indicate the MSD exposure has expired for any MSD device currently loaded in the placement machines? 4.7 Is there evidence of correct implementation of J-STD-0033A for all MSD devices? 4.8 Are there MSD procedures in place to ensure MSD shelf life is reduced based on measured Relative Humidity conditions? 4.9 Is there a method in place to address the time spent in dry storage and its effect on remaining life based on MS Level and RH Level? 4.10 Is it clearly understood that MSD ‘shelf life’ continues to degrade during dry cabinet storage of some MSD devices? 4.11 If MSDs are on both sides of a PCBA, is there an effective method to account for time between 1st and 2nd reflow? 4.12 Can MSD control be demonstrated for MSD devices that need internal/external pre-programming? 4.13 Can MSD control be demonstrated for rejected devices and devices used for rework? 4.14 Have MSD recovery methods been defined and adequate for all component types? 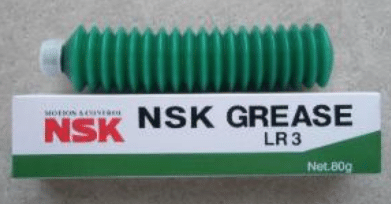 4.15 Does the control of Moisture Sensitive Components include those components on reels? 4.16 Is the baking or hot room storage time and temperature documented and controlled for component recovery? 4.17 Has this time and temp been determined based on the component supplier’s guidelines / J-STD-0033A? 4.18 Is there evidence to demonstrate that the control process for MSDs is in use and is effective? 5.1 Are Component Placement Programs generated from CAD XY coordinate data? 5.2 Is there a standardized nomenclature for Shape Code definition? 5.3 Can this nomenclature be used to determine the most appropriate shape code to allocate to a given part of given dimensions? 5.4 Are localized fiducials used for fine pitch devices when localized component fiducials exist on the board? 5.5 Has manual component moving been eliminated given correct CAD, nozzle set-up, Shape Code allocation, local fiducials, Cam speed, etc? 5.6 Does the Fine Pitch placement machine have the capability to check lead Coplanarity in xyz? 5.7 Does the Fine Pitch placement machine use its coplanarity capability on all leads of 20 mil pitch or less, and all programmed parts? 5.8 Does the Fine Pitch placement machine have the capability to check ball arrays? If no such device, score NA. 5.9 Does the Fine Pitch placement machine use its ball array verification capability for all BGA devices? If no such device, score NA. 5.10 Is the machine Program Name revision controlled to show traceability of program changes? 5.11 Is the machine Program Name traceable to the PWB and PCBA part number? 6.1 Are outputted boards at least sample inspected pre reflow for placement positional accuracy for machine control purposes? 6.2 Is the frequency for this verification defined and documented, and is there evidence to suggest it is followed? 6.3 Is there a visual aid available which identifies the populated locations with polarity, and also the no-pop locations? 6.4 Is there a placement standard pre reflow to validate placement accuracy for the shape code, nozzle allocation, etc. parameters used? 6.5 Is there evidence to demonstrate that action is taken to adjust the machines performance for when this standard is exceeded? 7.1 Is attrition rate monitoring conducted systematically to ensure feeder and/or nozzle problems are captured at least hourly? 7.2 Is there documented evidence to ensure attrition rates are checked and actioned at least hourly to ensure process control? 7.3 Is there a specification defined for acceptable attrition rates for the individual feeders? 7.4 Is there a specification defined for the maximum allowable number of nozzle skips per machine before it is shut down for repair? 7.5 Are these specifications determined based on a percentage combined with the number of placements for a given time period? 7.6 Is there evidence to demonstrate that attrition rate monitoring is conducted, effective, and used to make process control decisions? 7.7 Is there a documented process for the disposition or reuse of machine rejected components? Rs and Cs must not be reused even for rework. 7.8 Are rejected components reviewed and repaired to ensure conformance before reuse, even if only used for rework? 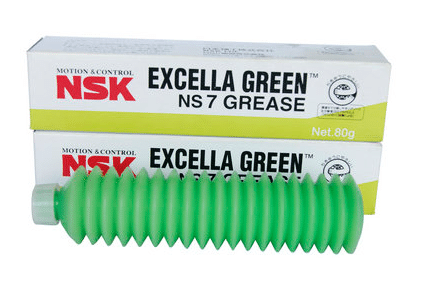 7.9 Are there repair blocks available or a lead conditioner in use for repairing ‘real’ Coplanarity rejects? Score 0 if parts not repaired. 7.10 Does the re-traying process always ensure that component polarity wrt the tray and the component loading polarity is preserved? 7.11 Is there a documented Process Deviation procedure to manage machine skips for hand placement if hand placement is allowed? 8.1 Has a Process Capability Analyses (PCA) been conducted and the Cpk acceptable for the suite of shape codes in use? 8.2 Were shape code allocations, component nozzle allocations, cam speeds, etc. recorded for this PCA? 8.3 Are the recorded shape code allocations, component nozzle allocations, and cam speeds, the same as those used today?